CARFAX One-Owner. 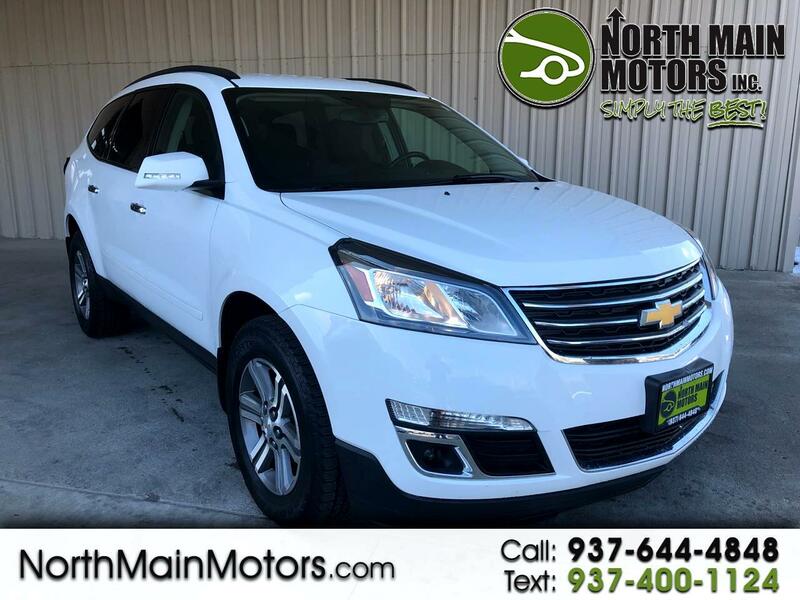 North Main Motors is very proud to offer this superb 2016 Chevrolet Traverse 2LT In Summit White. This vehicle is beautifully equipped with Front License Plate Bracket Mounting Package, Preferred Equipment Group 2LT (8-Way Power Driver Seat w/Power Lumbar, Auto-Dimming Inside Rear-View Mirror, Bluetooth® For Phone, Body-Color Bodyside Moldings, Body-Color Heated Power-Adjustable Outside Mirrors, Bose Premium 10-Speaker Audio System Feature, Enhanced Driver Information Center, Front Fog Lamps, Frontal & Side-Impact Airbags, Heated Driver & Front Passenger Seats, Interior Wood Grain Center Stack & Interior Trim, Leather-Wrapped Steering Wheel, Rear Audio System Controls, Rear Park Assist, Rear Power Liftgate, Remote Vehicle Start, Tri-Zone Automatic Climate Control, and Universal Home Remote), 10 Speakers, 3.16 Axle Ratio, 3rd row seats: split-bench, 4-Wheel Disc Brakes, 7-Passenger Seating (2-2-3 Seating Configuration), ABS brakes, Air Conditioning, Alloy wheels, AM/FM radio: SiriusXM, Auto-dimming door mirrors, Auto-dimming Rear-View mirror, Automatic temperature control, Bodyside moldings, Brake assist, Bumpers: body-color, CD player, Color Touch Navigation System, Compass, Delay-off headlights, Driver door bin, Driver vanity mirror, Dual front impact airbags, Dual front side impact airbags, Electronic Stability Control, Emergency communication system, Exterior Parking Camera Rear, Four wheel independent suspension, Front anti-roll bar, Front Bucket Seats, Front Center Armrest w/Storage, Front dual zone A/C, Front fog lights, Front reading lights, Fully automatic headlights, Garage door transmitter, Heated door mirrors, Heated front seats, Illuminated entry, Low tire pressure warning, MP3 decoder, NavTraffic, Occupant sensing airbag, Outside temperature display, Overhead airbag, Panic alarm, Passenger door bin, Passenger vanity mirror, Power door mirrors, Power driver seat, Power Liftgate, Power steering, Power windows, Premium audio system: Chevrolet MyLink, Premium Cloth Seat Trim, Radio data system, Radio: Chevrolet MyLink AM/FM Stereo w/CD & NAV, Radio: Chevrolet MyLink AM/FM Stereo w/CD Player, Rear air conditioning, Rear anti-roll bar, Rear audio controls, Rear Parking Sensors, Rear reading lights, Rear window defroster, Rear window wiper, Remote keyless entry, Roof rack: rails only, Security system, SiriusXM Satellite Radio, Speed control, Spoiler, Steering wheel mounted audio controls, Tachometer, Telescoping steering wheel, Tilt steering wheel, Traction control, Trip computer, Turn signal indicator mirrors, Variably intermittent wipers, and Voltmeter! Reviews: * Smooth ride even when the road isn't; can accommodate up to eight passengers; plenty of cargo space behind the third row; peace of mind that comes with top safety scores. Source: Edmunds From the moment you step on our lot until the time you drive away in your next car, your buying experience with North Main Motors is our number one priority. We encourage you to use the expertise and resources of our sales staff - they are here to help you find the right car at the right price. Call us today at 937-644-4848 to schedule your test drive!